NOTE: THESE ARE SPECIAL POINTS TO TAKE NOTE FOR THIS ART SEMINAR! 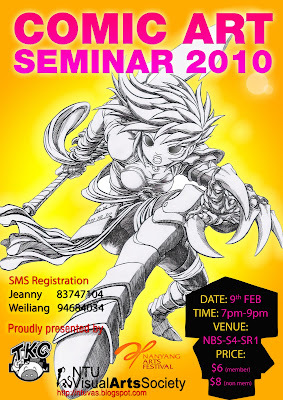 People who have attended the "Comic Art Seminar 2009" last semester will be allowed to take part in the ADVANCED COMIC ART training session. However, if you are a FIRST-TIMER, i.e. new to this Comic Art Seminar series, you will be given the chance to enter into the BASIC TRAINING session.